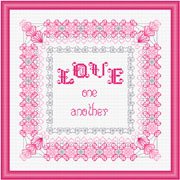 Back stitched lace comprised of many heart shapes and their enhancement, create the border. The word ‘LOVE’ is intricately detailed. Floss may be changed. Mostly back stitch is used.